Collab names don’t come much more obvious than this; however, for the Rocky Ridge team, this one has been nearly two years in the making. That "special" beer is a 100 percent wet hop sour ale that uses Cascade, Chinook and Flinders hops the collaborators handpicked from the Rocky Ridge hop garden. These were added to the sour base along with 200 litres of Eagle Bay seawater, presumably brought over in plastic buckets while listening to Daddy Cool, before adding kveik yeast for the final ferment. The result is a cross-pollination of old and new styles by an industry upstart and a pair of venerated WA icons which lands exactly in the middle. Briny aromas swell with grapefruit, citrus, nectarine, apricot and a touch of cut grass on the nose. 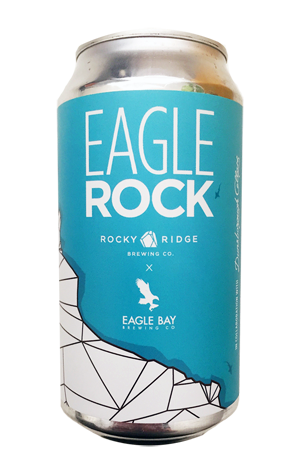 The palate rolls initially sweet before an affable hop bitterness arrives, seemingly negating any sour acidity - Eagle Rock is far more approachable than one might expect. Resin lingers in the back of the mix as the kveik yeast strain’s personality weaves something undefinably unique throughout. Low carbonation and salinity contribute weight and a round mouthfeel, although the collaboration retains enough levity to remain very drinkable.